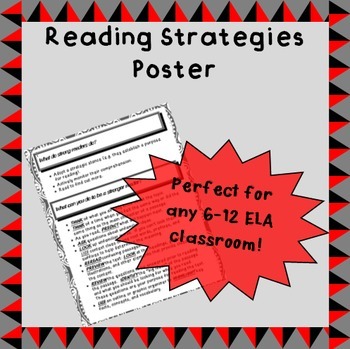 This poster has tips for what strong readers do and what your students can do to become stronger readers. This is ideal for a teacher who has access to a poster maker machine at his/her school so it can be blown up and laminated and hung as a large poster. It serves as a checklist for when students are reading in groups or independently to make sure they are utilizing strong reading strategies (i.e. marking the text, predicting, etc.). This file is .pdf and requires Adobe Acrobat Reader to view. If you have questions about this product, please contact me at madeyemoodyproductions@yahoo.com.